In this post, we will see about Bellman ford algorithm in java. 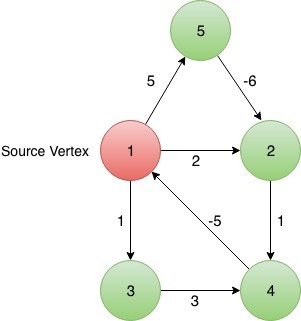 Bellman Ford Algorithm is used to find shortest Distance of all Vertices from a given source vertex in a Directed Graph. Dijkstra Algorithm also serves the same purpose more efficiently but the Bellman-Ford Algorithm also works for Graphs with Negative weight edges. In addition to that, it also detects if there is any negative Cycle in the graphs. In the first line, given two space separated integers, that is, number of vertices(V) and edges(E). Next E lines contains three integers each, which represents an edges from first integer to second integer with weight equal to third integer. In the last line given an integer representing the source. Output the shortest distance of every vertex from given source. Basically in this algorithm, we are looping in a random set of edges, vertices-1 times. That random set can be any order of all the edges of the given graph. For every edge, E(u->v), we check if the current distance of v from source is greater than the distance of u and the weight of this edge combined, if it is, this means that we just found a better path with lesser distance than the previous path, and we update the distance of Vertex v from source to distance of u + weight of E(u->v). We first need to initialize the distance of all the vertices from source vertex to be Infinity except the source vertex itself, as it is 0 distance away from itself. We need to maintain a Hashtable for storing the nodes which contain, name of vertex, distance from source node, path of the shortest distance from source to this vertex. Vertex, Node will be the key value pair for the table. Here distance(x) represents shortest distance of vertex x from source node till that iteration. edge(4->1), distance(1) < distance(4) + weight(4,1), distance(1) will not be updated and hence no updation in their path as well. edge(3->4), distance(4) < distance(3) + weight(3,4), distance(4) will not be updated and hence no updation in their path as well. edge(5->2), distance(2) > distance(5) + weight(5,2), distance(2) will be updated to 5+(-6)= -1 and the path of vertex 2 will now be, path of vertex 1 + “2”, that is, 1->5->2. edge(1->2), distance(2) = distance(1) + weight(1,2), distance(2) will not be updated and hence no updation in their path as well. edge(1->3), distance(3) = distance(1) + weight(1,3), distance(3) will not be updated and hence no updation in their path as well. edge(3->4), distance(4) < distance(3) + weight(3,4), distance(4) will not be updated and hence no updation in their path as well. edge(5->2), distance(2) = distance(5) + weight(5,2), distance(2) will not be updated and hence no updation in their path as well. No edge(u->v) will hold the condition distance(v)>distance(u)+weight(v, u). After (Vertices – 1) iterations are done, we iterate the same list one more time to check if there is a negative cycle or not. During this very last iteration, if there is updation in the shortest distance again, this means that there is definitely a negative cycle in the graph, and hence, the shortest distance of every vertex can not be calculated for this graph as we can keep looping again and again in that negative cycle to keep reducing our distance further. Thus, we print that the graph contains a negative cycle and return from the function. We can clearly have the doubt of why do we need to iterate (vertices – 1) times, when we can achieve the shortest distance in less than (V-1) iterations. The number of iterations it will take to find out the shortest distance for every vertex, completely depends on the random order in which we are processing our edges. Remember, I am emphasising on finding out shortest distance for calculating which in the worst case we need to iterate atleast (vertices – 1) times. What if we had the order of the set starting with farthest(in terms of edges) from the source node, we would try to check if dist(2) > dist(5) + weight(2,5), but the correct distance of 5 isn’t calculated yet and it is still Infinity, so we do nothing, and now we move to second edge whose correct distance again isn’t calculated yet, so we do nothing again, so ultimately after this iteration end we will be able to update distance of only those vertices which are immediate neighbour of source. => for (1,2), distance(1) > distance(2) + weight(1,2), therefore, distance(2) gets updated to 5 from Infinity. => for (2,3), distance(3) > distance(2) + weight(2,3), distance(3) is now 5+6 = 11. => for (3,4), distance(4) > distance(3) + weight(2,3), distance(3) is now 11+7 = 18. We see that the shortest possible distance of all the vertices(2,3,4) from source(1) got calculated in just one iteration. In the first iteration, no updation will be seen for any edge except the immediate neighbour of source vertex, because while calculating the distance for vertex 4, distance of vertex 2 hasn’t been calculated yet. Same will be the case while calculating for vertex 3. Distance of a farther vertex can’t be calculated until we know the distance(doesn’t matter if it’s smallest or not) of closer vertex. In second iteration, no updation will be there for vertex 4, as the distance of closer vertex 3 hasn’t been calculated yet. So updation will be seen for vertex 3 as we already calculated a distance of vertex 2 from source vertex. And now in the third and (vertices-1)th iteration, we finally find the distance for vertex 4 because now we know the distance of vertex 3 from source vertex. There we see, number of iterations totally depends on the random order in which we process the edges, but in the worst random set of edges, we needed to iterate (V-1) times to completely calculate the shortest distance of all vertices from given source node. And hence we have our answer for the question, Why do we do this process for a random set of edges for Vertices-1 times? and every time we are processing a set containing all of the Edges. Therefore, the worst time Complexity for this algorithm will be O(V*E). nodesMap.put(i, new Node(i, i == src ? 0 : (int) 1e9 + 1, i == src ? That’s all about Bellman ford algorithm in java.